One of our members pioneered the use of a 50mm finder as a small lens for use on NV gear and this sounded like such a good idea that I bought two for the Mod 3, but I do intend to use one of them on the PVS-7 as well. 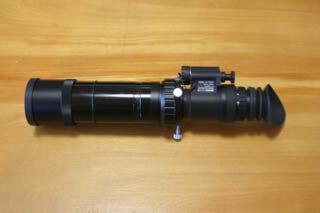 This has a built in helical focuser, an the tube itself is adjustable so should reach focus from very near to infinity. I have to say that I very much like the handling vs a camera lens, which tends to be much heavier. These are 190mm and f/3.9, so not the fastest lenses, but it makes for a very light and easy to hold lens, and the helical focuser gives very precise focus. Because it mounts over a 1.25" eyepeice barrel, 1.25" filters can be used. I have not had a chance to use it under the stars, but dark room testing on a test target showed surprisingly bright and sharp images. Very nice concept, and fingers crossed that it will work. Ed, I am using the 50mm f/3.2 guide scope that Orion sells for $102, but I bought used here on CN. It works well, and I have no trouble reaching focus. Mine does not have a helical focuser but, with the objective adjusted all the way rearward, and the scope mounted about halfway down my 1.25" adapter, it reaches a nice sharp focus. Although I have not had many clear nights of late, I have used this set up with my PVS-7 pretty much exclusively rather than using 1x. I think that you are going to find this scope quite enjoyable! I am excited to try it. it is far lighter than the big 200mm f/2.8 zoom and it would not surprise me if I found it to be sharper. This has been my major issue with fast SLR zoom lenses. The ones I have do not seem to be nearly as sharp as the Comet Catcher and while they are nominally "faster" they don't seem much brighter than the Comet Catcher. And they are way heavier. This by comparison is quite light. Eager to give it a try and especially hopeful that a pair of them will work well with the Mod 3. The price was cheap considering that they come with adjustable guide rings and dovetail. Quite a good deal I think at 2 for $149. Cool, I'll try out the 50mm helical focuser, never thought about using it with the NV device. FWIW, if your experience is like mine, stars are going to look pretty bad using the finder and no filter. My 7nm Ha filter cleans them right up though, as does the 610nm filter. I am sure that there's a reason for that, but I am not sure why. I also use a 50mm F3.2 straight-through guide scope (same as the Orion one but this model has a helical focuser) with my Micro (about 6x). Although it is a monocular, the views under my heavily light polluted sky remind me of the views through 7 x 50 binoculars when used under a really dark sky. These are the “binocular-like” views I have always wanted but could never get from my light polluted home. Light. Hand-holdable. Easy to change filters. No connectors. Go anywhere. Quick looks between clouds if conditions are too iffy to set up a scope. Swapping the Micro from the 50mm guide scope to a telescope is as easy as removing and eyepiece. Inexpensive. And Powerful. Great for sky sweeping and the really big stuff. Although I was shocked to see a small but still noticeable arc of the Veil Nebula with just 50mm from my location! My guide scope would also not come to focus even with the focuser all the way in (it was close but not close enough). I also had to loosen the objective lens retaining ring and screw the objective lens rearward as far as it would go. Then the Micro came to focus with some room to spare. Eddgie, your model is different so in-travel could be an issue. Hope it works out. If not, these models will work. Filters help because these are short focus achromats with chromatic aberration. Below is my Micro attached to the 50mm guide scope with helical focuser. Doug, its for the exact same reasons I tout achromats as perfectly acceptable for filtered NV use. some slight secondary spectrum out of focus issues with near ir pass filters (slightly less tight on stars) and zero out of focus issues in narrowband and IR pass filters. The near IR longpass filters tighten the focus up enough that it is a non-issue. I dont ever view NV unfiltered. Just a quick report on the CCD finder lens. I had no trouble reaching focus. It was very close but both the Mod 3 and the PVS-7 reached focus with maybe 3-4mm to spare. I did not like them on the Mod 3 for mechanical reasons (binocular configuration... 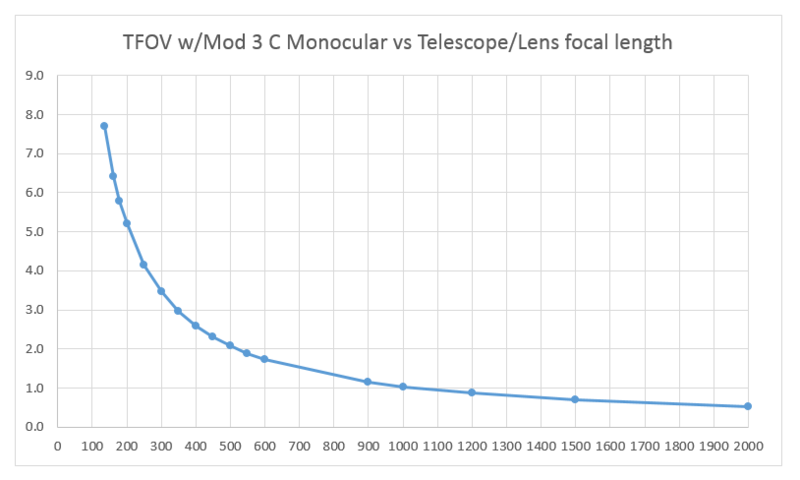 The mechanical play in the Mod 3 binocular made collimation constantly shift and I don't have this issue with the 3x lenses but 7x and the long housings aggrevate this problem). They worked much better on the PVS-7 where there were no issues with collimation and merging. Even with filters, I did not think stars were as sharp as they were in my Comet Catcher, but they were much better than I had expected, and to be very frank, I think the views were better than I have been getting with my big, fast SLR zoom lenses. I have struggled with the zooms because stars don't focus to very tight points and the weight makes them just uncomfortable to use. At f/3.8, I did not have much of an issue with field curvature with the finder and stars were indeed sharper then with the SLR lenses I have been using..
With H-a 12nm, I was surprised to see that the CCD finder seemed to do as well or better on Nebula as the 200mm f/2.8 zooom! My guess is that there is a lot of absorbtion in the zooms, or perhaps the coatings simply are more optimized for visible light???? I don't know, but I know that the CCD f/3.8 finder seemed to do as well or better on nebula as the supposedly faster SLR lens. Stars were sharper too, so this will replace the 200mm SLR lens, which I already knew was not giving a result that made the weight worth it. This confirms to me though that SLR zoom lenses simply are not all that great for NV work. Maybe newer models with ED glass or Apo types would be more suitable, but these big fast SLR lenses can be very expensive, and worse than that, very heavy to hand hold. I am on the fence about selling one of these because I don't think I will use them on the Mod 3, but I do think that they work well overall and at $75, I have to say that I highly recommend them over older zoom type SLR lenses. A great concept and thanks to a clever CN member for the idea! Worked nicely on the PVS-7. (And again, these will work on the Mod 3 monocular.. It is only the bridge mechanics of the binoviewer that prevented me from working well on the binocular. I may look at ways to eliminate some of the play in the Mod 3 bridge interface, but the reality is that I think I would not use the 7x lenses simply because of the multiple steps required to swap them on and off. Trivial in the Monocular or the PVS-7 because far fewer steps). Have been trying to get a chance to do a more thorough test of the 50mm f/3.8 CCD finder. Finally had a cloudless night with somewhat reasonable transparency. Not great, but reasonable. I could see a decent number of stars with naked eye, but I was not able to easily see the principle stars of Cygnus. The main challenge for me was to avoid the distraction of just looking around because it has been weeks since I have had even half way reasonable conditions. The Milky Way was of course quite stunning. One of the top five nights since owning the Mod 3 binocular, so I had trouble pulling myself away from the Mod 3 at 1x and 3x. I did not like using two of these CCD finders for the Mod 3 by the way.. There is just enough play in the mounting of the Mod 3 pods that the very long CCD finder tubes don't stay collimated unless I further flex the pods against the bridge and I just don't want to do that. Perhaps I can find a "Natural" alignment for the tubes (maybe rotating and marking them) where they settle at the correct angle, but for now, I am simply using the PVS-7, which is kind of sad because I bought them for the Mod 3. That being said, even the PVS-7 views of the Milky Way were very sharp last night using 1x and 3x. In fact, last night, even the green Milky Way was simply crazy good!!! I used the PVS-7 for the testing though because it was just easier to manage one lens when changing filters. The lens is yielding about 7x.. Stars are not pinpoint sharp but they are decently sharp with the 650nm Deep Sky IR Pass filter. I have settled on this filter for most viewing because unlike the 680nm, you can still see Nebula with it and at f/3.8, the sky is already darkened so the filter does not seem to provide as much benefit as it would at f/1.2 or f/2.This lens puts up a view that seems to be better than my much heavier 200mm f/2.8 zoom when it comes to star sharpness. I tried a full aperture 680nm and stars did not appear any sharper, but again, stars were still decently sharp and much better than I had hoped for. Even with just the 650nm IR Pass filter, I could quite easily see the shape of the Swan nebula and the Eagle was easily visible. The Lagoon was only just visible and the Trifid was only hinted at and only because I knew were to look. The darker structure of the Milky Way is so large that it much of it does not stand out well at 3x, but I could see the texture of the folds and ripples pass though the field as I swept around. Very enjoyale! H-a results were quite excellent! I have used a variety of SLR lenses with more aperture and I had expected that the 50mm f/3.8 would struggle to show these nebula very well, but I am more than ever convinced that my older zooms are simply not passing light as efficiently as this little cemented doublet. The lens put up a quite excellent view of the Logoon and Trifid that I don't think has been matched by my f/2.8 zooms. There was considerable structure and extension and the nebula really popped out from the starry background. With the H-a, stars are very sharp. Even at 7x, the Trifid was big enough and shown well enough that I could see one prominent and irregular lane, but to small to resove the smaller branches. Now I can see much more structure in it with the Comet Catcher, but here, the beauty (as with Peter's recently posted picture) is seeing both the Trifid and Logoon in the same true field. Swan was also very nice. Even at 7x, the shape is quite well defined and I was able to see some of the knotting that follows behind and below the duck's tail. This was the best view I think I have had of the swan using any kind of attached, hand held lens. Small, but not at all difficult to see these kinds of details. Once again, better in the Comet Catcher, but you don't get the much bigger context of the rich stars around it (even with the H-a, there is a lot going on in the field). Even North American was better than the 200mm f/2.8 zoom. I could see the shape quite easily and the Pelican was also visible but not nearly as good as with the 3x afocal lenses, and indeed this is one of those targets that looks utterly fantastic in the 3x lenses, and one of the reasons I am so attracted to those lenses. I only have one H-a filter, so I can't really get the most out of the Mod 3 binocular, but I am going to fix that pretty soon. I do very much like the helical focusers. Mine are kind of grainy, but my guess is that they will break in. it is very nice though to have such slow, precise focusing. In this kind of scope, even with filters, stars to not seem to have a very distinct best focus, so I have to rack back and forth a bit to find the smallest blur diameter, and the helical focuser makes that pretty easy to do. (With H-a, star focus is very precise by the way). I am very pleased with this lens vs the SLR lenses I have been using. Stars are sharper and in spite of the slower focal ratio, it seems to do as well or even better on nebula. There has to be some amount of transmission loss and absorption on these older SLR zooms. My result has been much better than I had expected as far as Nebula go, and stars are indeed sharper. My guess is that if I could afford a very fast 200mm ED lens, I could get a better result, but for now, I am getting a really pleasing performance, so I am going to stand pat for the time being. An excellent buy in a longer hand held lens. These sell for about $80, and this would be money well spent for most PVS-7 owners that don't want to tie up a lot of money in a super fast long focus ED lens. Edited by Eddgie, 06 September 2016 - 08:45 AM. I got one of these this week, as well as a Baader 685nm IR longpass (which I'm hoping to use as a replacement for the $10 55mm "Ebay special" IR filter). I finally got to take it out briefly tonight, and it was then that I realized how disastrously placed the Moon is right now. However, standing in my neighbor's driveway and in the glare of their porch light, I was able to see Ptolemy's cluster as well as M62. Ptolemy was tough because it was about 15 deg below the bright Moon, and the dew shield of the finderscope I got was not flocked, so the glare was pretty terrible. Nonetheless, it was quite distinctive. M62 was also difficult to appreciate in any detail, but it was unmistakably there, even in the glare of the glaring moonlight. I think that perhaps the optics in the finderscope I got are not so hot. The mechanical construction is pretty solid, actually, but I think something is a little out of alignment because the stars are just not that sharp. Now, it might be because I'm spoiled by my Mod3 filmless tube now, and I'm making these observations with the PVS-7. But when I switched back to the ENVIS objective, stars still looked sharper than what I was able to see through this finderscope. This is not a scientific test by any means, but I will have to more thoroughly test it out at some point in the future, under better conditions, and with the Mod3 as well as optical eyepieces, on a stable mount. Tested my finder last night, good image scale and worked well with my hydrogen alpha filter. I concluded I need a longer pass 1.25", so that baader is on the shopping list now. I have used long pass fitlers and they sharpen stars but stars still do not focus as small and sharp as with reflector. Better than any of my SLR zooms though, and much lighter! Had a really excellent view of North American using the 50mm f/3.8 with 10nm H-a filter last night using it on PVS-7. At $75, I can't complain, but at the same time, I am looking at the $59 table top scopes and wondering if the all spherical f/4 mirrors on these scopes would produce sharper stars. I also like the fact that they have their own little mounts. The focusers look poor, but it isn't like we have to focus every time we change eyepieces. I am planning on going the Orion 50mm f/3.2 guide scope route as well (as soon as I can procure one from the used market)... Seems tough to beat at 162mm f/l and a proven solution. You need to keep focal lengths short to maximize TFOV! TFOV drops like a rock between 100mm and 200mm. 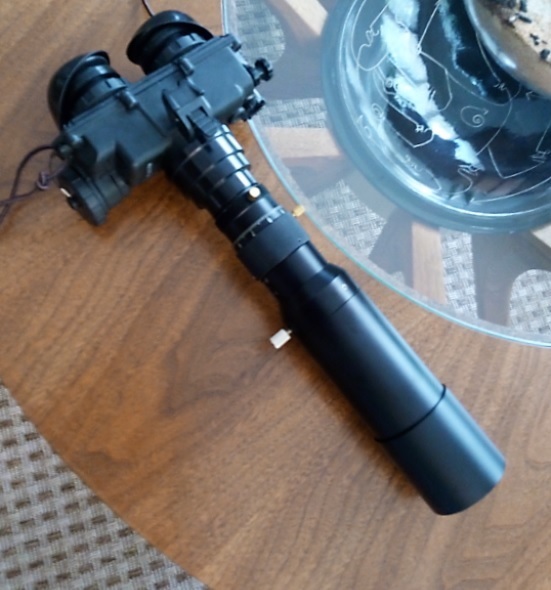 I bought the Orion 50mm Guide Scope w/helical focuser at new (sale) price, but then was able to score a good deal on the used market for the non-helical focuser version. I can highly recommend both as others have on this thread as well. Very nice performance with 685nm Longpass and 7nm h-alpha filters in light polluted skies. No vignetting and no aberrations seen at least in this fast, f/3.2 achromat. I don't really see the added value of the helical focuser for my needs and the additional $$, so that one will be going back to Orion. But just wanted to chime in that I'me VERY happy that there is a cheap, focally fast, readily available option that does not vignette for low mag, hand-held NV usage. In practice, I actually preferred the push/pull method since that can really quickly show you best focus. The helical focusing is so fine that it is hard to tell if you are leaving or approaching best focus and that takes more time and then you have to keep the NVD + Finder stable on the star field. However, I think that you could probably just do it once and lock the focus i.e. set-it-and-forget-it with the helical focuser, right? Not sure how much the focal point changes (if at all) with different filters though, that may be a factor to consider.